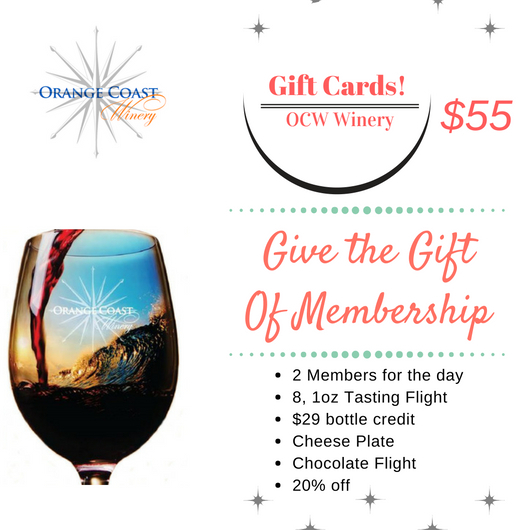 Memberships at OCW are a excellent way to experience some of California’s finest wines in a relaxed, fun, social environment. As a smaller production our wines are hand-crafted with generations of knowledge poured into each bottle. Join us today, for a wine experience you’ll be sure to enjoy. Ask your server for more info on gift cards. Also available in $25, $50, $75 & $100. Orange Coast Winery reserves the right to cancel memberships at any time. Cancellations initiated by members will only be accepted after the minimum of two club charges have been met. Request to discontinue your membership must be done in writing and received by the 20th of the month prior to your next scheduled charge date. Fees are non-refundable if a cancellation is made after the scheduled billing date. Memberships terms & conditions are subject to change.